A grandmother who has fundraised more than £40,000 comes face to face with a former soldier whose life she has helped to transform in a video released today to celebrate the bond between Help for Heroes’ beneficiaries and its supporters. The film sees passionate fundraiser Dorothy Garrett, 72, meeting 30-year-old Mike Matthews, who tells of his struggles with Post Traumatic Stress Disorder (PTSD), a result of being seriously injured when the vehicle he was driving hit a roadside bomb in Afghanistan. During the conversation, Dorothy tells of how she was inspired to volunteer for Help for Heroes by the memory of her grandfather, who fought in the First World War but was unable to survive “civvy street” and took his own life because of mental health issues. Over the past two years as a charity volunteer, Dorothy has rallied a team of volunteers and together they are on track to have raised more than £40,000. It is the support of Dorothy and other volunteers that has helped Mike in his recovery from PTSD and physical injuries, including sustaining a broken back in the bomb blast. With the aid of Help for Heroes, Mike was supplied with a specialist bike and discovered a passion for cycling. He has also taken up wheelchair rugby and developed a love of poetry, where he can write down all his feelings. Mike, from Cardiff and a former Lance Corporal in the 2nd Battalion of the Royal Welsh, tells Dorothy: “Without that moment of Help for Heroes helping me I don’t know where I would have got led. “But because of people like you I was able to have a bike, and because I was able to have a bike, I was able to escape my mental torture. The video is the sixth in a series which began with a heartwarming film of five-year-old fundraiser Tempy Pattinson and Iraq hero Simon Brown, which made national headlines and attracted more than 70m views. 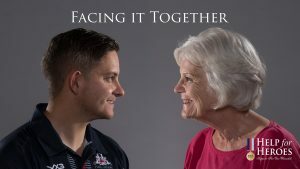 The Facing it Together campaign aims to show audiences the tangible differences that Help for Heroes supporters make to the lives of Veterans and their families. Mark Elliott, who helped Bryn and Emma Parry set up the charity in 2007 and is current Advocacy Ambassador for Help for Heroes, said: “Dorothy sums up the kind-hearted spirit of all our volunteers and it is her and other people’s fundraising that means we can help Veterans like Mike and put them on the road to recovery. “It is so important that people from completely different backgrounds and ages can connect through a common cause, and that is exactly what we see here. “We started Help for Heroes to raise money for Heroes and make the great British Public aware of our wounded, sick and Injured Heroes, but what has struck me above all is the passionate support we receive from fundraisers and supporters, tens of thousands of them. Help for Heroes continues its vital work and is entirely reliant on them.